Business to Consumer telemarketing is the sale of products or services to end-user, sometimes referred to as selling to the general public. B2C telemarketing is very different to B2B telemarketing and requires a very different approach from the scripting, to data sourcing, initial pitch, evaluation of interest and close. The great news is that contact rates are phenomenal. The instant interaction with potential customers produces a much better decision maker (DM) contact rate than almost any other form of marketing. 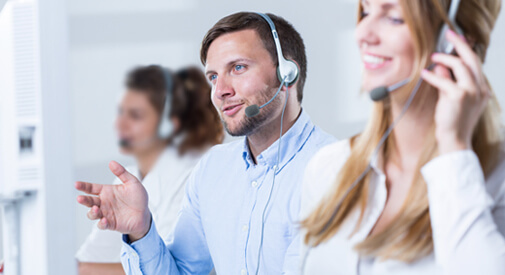 B2C telemarketing is therefore a guaranteed way of gaining an express answer from a client and is therefore a fantastic method of selling any product or service in significant numbers. Whether it is selling a product/service, obtaining new leads, organising product demonstrations, customer survey or mystery shopper type exercise, we will very quickly get you answers. Prior to starting a telemarketing campaign Amvoc will gain a clear understanding of your organisation, products and services so we can design a bespoke project that will increase ROI (Return on Investment). Our B2C team consists of telemarketing professionals that have an impressive track record of success in this particular field of telesales. Amvoc has the B2C telemarketing knowledge necessary to become an integrated and vital part of your marketing strategy.